"The Classic Cake Box delivers the perfect combination - tea and cake! Four gorgeous and yummy cakes, plus a different flavoured tea bag, are delivered monthly through your door meaning you can enjoy this winning combination from the comfort of your own home, at any time of day. You no longer need to venture out to your local tea room (or your nana's!) to get a taste of a delicious homemade sweet treat. Plus, each box comes with a recipe card for you to recreate one of the treats, meaning you can continue to enjoy a great bake over and over again! My first impression was I could not believe how compact the box was and it fitted through the letterbox! I was so excited to open it and see what treats were in store for me and I was not disappointed. 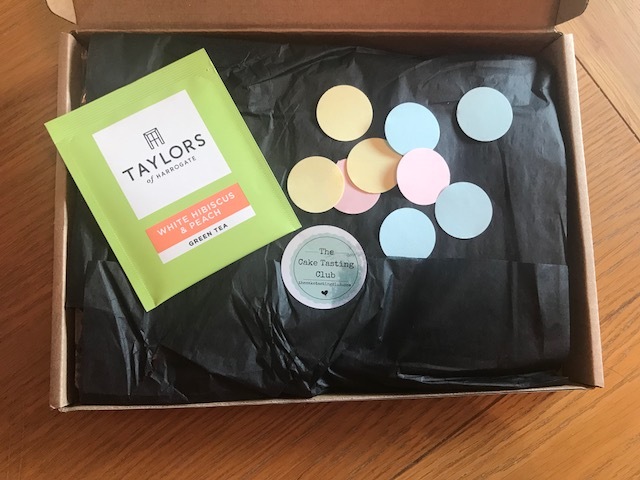 I was presented with a beautifully wrapped parcel complete with a ‘The Cake Testing Club’ sticker, a Taylors White Hibiscus & Peach tea bag plus some confetti - it was like opening a thoughtful birthday present. 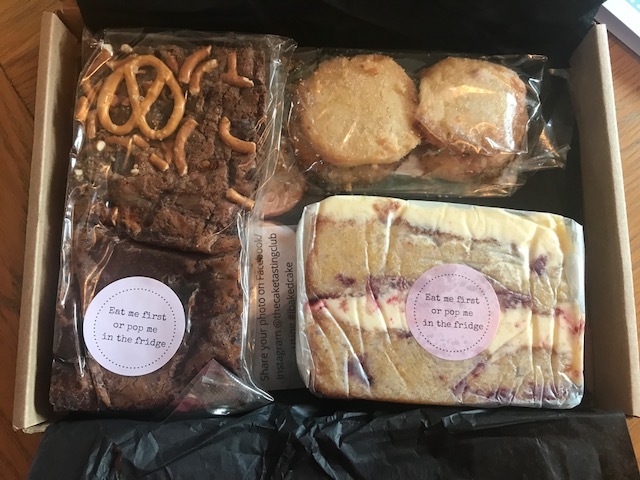 As I delved into my box, the thoughtful touches continued as I found a lovely handwritten note, a card detailing the bakes of the month and a recipe card for one of the bakes- all this before the real treats! The bakes themselves sounded amazing, and I immediately popped the kettle on ready settle down with a cup of tea to have with the Salted Caramel Pretzel Brownie! I had half an hour to spare before having a full house, and it was the perfect way to relax after a day in the office. The brownie was amazing - gooey, chocolatey and the perfect amount of sweet and salty flavour from the caramel and pretzel combination - who knew that would work?! The lemon elderflower and white chocolate shortbread was the perfect treat to offer out to the in-laws when they popped in for a cup of tea over the weekend- four biscuits for four people! Everyone enjoyed and asked if I had baked them myself, I could not take the credit this time, but now I have the recipe I certainly can do next time! The Classic Cake Box is just £15.00 - great value if you ask me! Each cake comes with an expiry date and most of the bakes - if you can resist for that long - have at least a week’s use by date on them, meaning you really can enjoy this over an extended period. Considering I would happily spend money in a tea shop catching up with one of the girls enjoying just one piece of cake and a cup of tea I felt like it was reasonably priced. Overall I loved this box - from beginning to end it felt like a special treat with all the thoughtful touches, and the cakes were delicious. I LOVE cake and to have tasty homemade bakes delivered to my door for me to enjoy was something dreams are made of! The tea also made a great addition, and I look forward to seeing what arrives in my next box. I can’t wait to share this with my other cake-loving friends. All in all, a perfect way to take half an hour and relax with a cup of tea and cake - a match made in heaven!" Enjoy four portions of baked loveliness every month with a subscription to The Cake Tasting Clubs’ Classic Cake Box. Indulge yourself with a monthly dose of fluffy cakes, gooey brownies and tasty biscuits.